The Town of Falmouth, July 30, 2012 Draft Comprehensive Wastewater Management Plan details a strategy for removing the nitrogen polluting its estuaries and achieving Total Maximum Daily Loads (TMDLs) for nitrogen mandated by the Massachusetts Department of Environmental Protection (Mass DEP). Falmouth’s Eco-Toilet Incentive Program will establish how much nitrogen eco-toilets can remove from the human waste stream, in order to determine how useful these fixtures will be in reaching the town’s TMDLs. Homeowners who participate in the voluntary program will receive a $5,000 rebate for the permitting, purchase and installation of eco-toilets to replace all the existing toilets in their home; in addition, they will receive a free septic tank pump-out (a $300 value). In return, the eco-toilet owner must allow regular testing of their septic system by the Barnstable County Department of Health and Environment for up to one year. Working closely with regulatory agencies, a long-term goal of the program is to determine a nitrogen-removal credit for homeowners or businesses with eco-toilets. A total of 62 installations will be tested in order to quantify a nitrogen removal credit for regulatory purposes. Further, these installations will document the technical details of various models of eco-toilets, both in terms of installation as well as operation and maintenance. This research project will also verify the installation costs and user experience of eco-toilets. 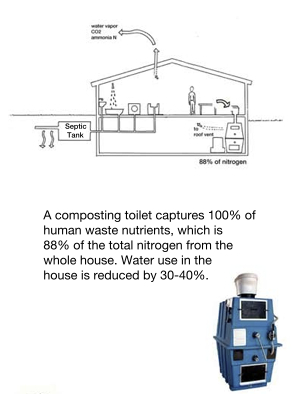 The cost, and practicality of retrofitting existing structures with eco-toilets is critical to an evaluation of whether these toilets are a viable alternative to more traditional wastewater management techniques. This demonstration program is endorsed by the Cape Cod Commission, and the results of this research will be used to quantify the effectiveness of these systems in their “Regional Wastewater Planning Matrix” planning tool. Numerous installations of eco-toilets in Europe, Scandinavia and Australia have been documented. But Falmouth’s Demonstration Program is unique in that it will include specific measurements and analysis of nitrogen removal. As a result, at the end of the testing period, the town expects to have the experience to handle a range of difficulties encountered in installing and using eco-toilets. If you’re a Falmouth resident, you can find out how to get an eco-toilet installed in your home or business by calling (508) 495-7327, emailing wqmc@falmouthmass.us, or by visiting the Water Quality Management Committee website. Ready to get going? Download the paperwork you’ll need to get the ball rolling! I live in South Yarmouth, So I imagine i cannot sign up for these programs – however that doesnt exclude me from using an ecotoilet does it? I would like to begin this process in my home. Many eco-toilets are permitted and commercially available in Massachusetts, so by all means, you can get started! We’d recommend checking out Types of Eco-Toilets to figure out what works for your home and budget, then contacting the manufacturer to see if they can recommend a local dealer and plumber with experience in installing these types of systems.